Wednesday Sewing – Occupy Your Sewing Room Movement! Happy Wednesday! Is it Wednesday? It’s one of those weeks where every morning I wake up I think it’s Saturday….wishful thinking, I suppose. More like, “Tis the Season”. Tis the Season for excesses – excessive shopping, excessive baking, excessive worrying, excessive stress…. But then I stumbled upon this fun little movement and now, at least in the sewing studio, I work with a bit of a smile! Head on over to Cat Patches to join in the fun! I am working on a lot of memory items – both locally and from customers around the country. Many are being made from the clothing of a beloved father. 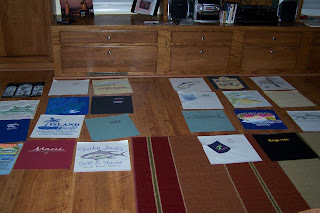 Currently I am making two T Shirt quilts made from a dad’s shirts. This isn’t my studio, but here’s a peak at my process of laying them out. It’s sobering to see the shirts and think about the person wearing them. These shirts are such a fun collection of fish and ocean-side bars, I imagine a crusty, fun-loving man! 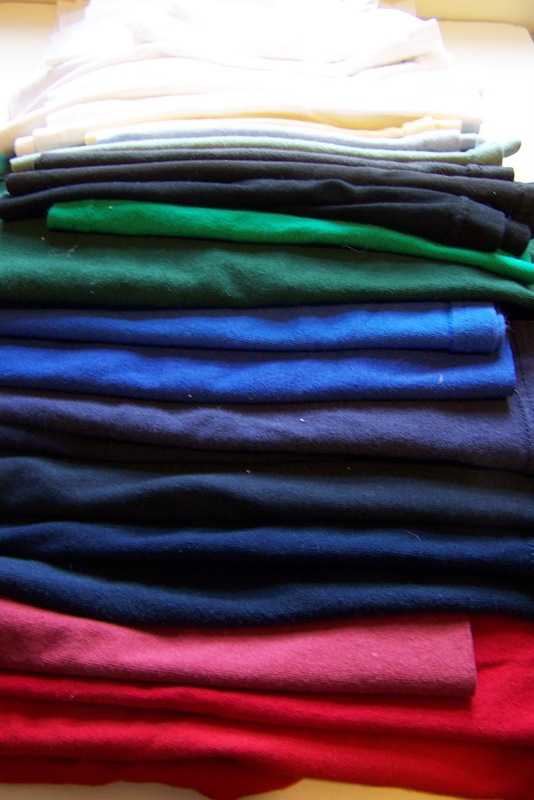 Because of recent sewing, I have another batch of T Shirt remnants. These aren’t listed yet, but if you are interested in them, let me know. I’m trying to develop a relationship with anyone who uses the shirts for their creations. 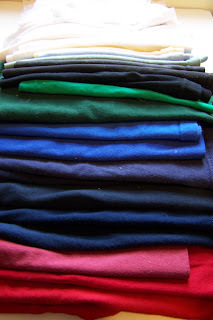 I have enough rags so would love to see these put to use to make T shirt rugs or T shirt yarn or necklaces….